The Harris XL-185P is the industry’s first and only single-band LTE Land Mobile Radio (LMR). Operating in the VHF, UHF, 700/800 or 900 MHz frequencies, this versatile portable merges robust LMR voice with data over cellular/LTE and Wi-Fi®. Open standards-based, Verizon Certified and Band-14 ready, the XL-185P gives organizations a flexible path to broadband and emerging first responder networks. 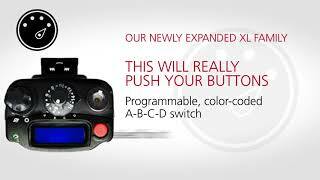 Contact us today for a hands-on demonstration with the XL-185P. With expanded connectivity options, the XL-185P is an ideal, economical choice for public safety and utility organizations. The portable is ruggedized with an aluminum I-beam frame to withstand extreme conditions and to meet MIL-STD-810G for durability. The XL-185P delivers industry-leading audio performance powered by a 1.5/4.0 watt max amplifier with dual speakers and advanced noise cancellation for clear, loud audio in a wide range of challenging environments. Tight Bluetooth integration with leading manufacturers of firefighting Self-Contained Breathing Apparatus (SCBA) systems improves in-mask audio and quality of communications on the fireground. Compact and ergonomic, the XL-185P’s controls are shaped for fast, easy, gloved-hand operation. A color-coded display and easy-access A-B-C-D switching allow fast identification and switching to priority talk groups.